Coming to Girdwood, Alaska? Stay at the Alyeska Prince Hotel and Resort. Because you can't properly enjoy Girdwood in a day, you'll want to take a look at my Girdwood rentals. Why get a vacation rental? Because you've been planning your Girdwood getaway for a long time. You want everything to be perfect. As a timeshare owner, I have access to the Girdwood vacation rentals at the Alyeska Prince Hotel and Resort. It's a veritable winter wonderland. I can't wait for you to come see Girdwood, Alaska for yourself. Where is the Girdwood Rental? What is there to do in Girdwood? How much will it cost to rent a unit? The word Alyeska is derived from an Aleut word meaning great land of white to the east. Located 40 miles south of Anchorage along the National Scenic Byway, Turnagain Arm, the Alyska Resort is a year-round destination. The sheer beauty of this particular area has made it a prime location for those interested in taking an Alaskan vacation. What is there to do at the Girdwood rental? 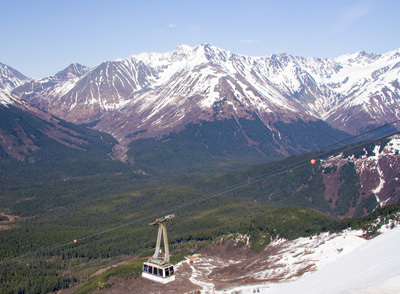 The Alyeska Resort Mountain boasts nine ski lifts including a 60-passenger aerial tram, moving more than 10,000 skiers to the tops its 68 runs per hour. Ski season runs from mid-November through mid-April, with weekend skiing continuing through Memorial Day as conditions permit. In addition, 27 trails are lighted for weekend night skiing December through March. Most people naturally think of all the fun they'll have skiing when they take their Girdwood vacation. However, there's a lot more going on at my Girdwood rental. 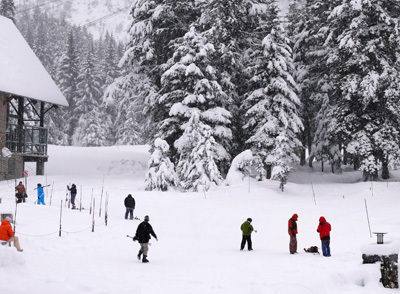 If you come to Girdwood in winter, you'll find yourself in a magical wonderland where adverture abounds. Try heli-skiing, dog sledding, glacier snowmobile tours, and ice climbing. Go snowmobiling. Rent snow shoes or cross country skis. Or just take a scenic tram ride to the top of the mountain for a visit to the Round House Museum. Admission is free! The Alyeska Tramway slows to half speed during the summer as it climbs to the top of Mt. Alyeska at 2,300 feet, allowing you to take in the spectacular views of Glacier Valley and Turnagain Arm. Don't forget to savor the Northern Lights. Check the UAF Geophysical Institute's Aurora Forecast when planning your trip to Girdwood. If you come when the sun is up, you can enjoy a number of fairs and festivals. For example, come to Girdwood in late April and take part in Alyeska's Spring Carnival. In August you can take in the Blueberry Fesitival and the Fungus Fair. Arrive in late September and you can marvel at the North Face Climb-a-thon & Vertical Challenge and Oktoberfest. Feel like staying in? Come to the resrot's Sitzmark Bar & Grill for their Film Series. The northern marine climate of Alyeska is surprisingly mild, and daylight hours range from 7 ½ in December to nearly 24 hours in June. Whatever season you choose for your visit to Alyeska, youll find mild Alaska temperatures and plenty of activities suitable for the whole family. What restaurants are near the Girdwood rental? At the Alyeska Prince Hotel and Resort itself, you'll find their own Sakura Restaurant, plus their Aurora Bar & Grill and the Pond Cafe. Also on the property is the delectable award-winning Seven Glaciers Restaurant. Feast on regional favorites like fresh Alaskan King Salmon, Alaskan Halibut or wild game while enjoying panoramic views of glaciers, the Turnagain Arm and the Chugach Range. Here's a tip for you: make your reservations in advance and the tram ride is free! Venture a bit south into town to find Jack Sprat Restaurant and The Bake Shop. Head west of town and discover the Double Musky Inn, the Chair 5 Restaurant, Casa del Sol Mexican Restaurant, Maxine's Glacier City Bistro, and the Silvertip Grill. What is the Girdwood rental like? Plus, youll find the accommodations at the Alyeska Prince Hotel luxurious, with a full line of hotel amenities all the way down to bathrobes and slippers. And cherry wood furniture, nature photography and vaulted ceilings lend rustic charm to the resort experience. What types of rooms are available at the Girdwood rental? Unlike the vast majority of the other vacation rentals on this site, the Alyeska Prince Hotel and Resort is not a WorldMark resort, but a hotel accommodation that sleeps up to four (4) adults. What do other people say about the Alyeska Prince Hotel and Resort? Anchorage's best hope for escaping another average weekend. Alyeska Prince is a high quality hotel featuring great location, great views, great staff and all the amenities you expect from a resort destination. Rooms are clean and comfortable and include bathrobes, slippers, toiletries, magazines, tv/cable and big fat cloud-soft beds. The hotel has several restaurants and a moody bar with complete with a fireside lounge perfect for your post-ski whiskey. Room service is available, or hit the gift store for souvenirs and midnight snacks. Take advantage of the fitness center with it's high cedar ceiling amplifying the joy of the pool/hot tub/sauna below. (Also available with a day pass). The bed was so comfortable I could have lived in it. It was a great hotel! We hiked down from top of the mountain it was beautiful. If you stay in Girdwood you should stay at the Alyeska. It was the best hotel I stayed at in Alaska. I had a great time there. How much will it cost to rent a Girdwood rental? Prices vary according to season. Tell me about your date preference(s) and the size of your party and I'll check availability and get you a price. Your price will include all Occupancy and other taxes. Tell me when you'd like to come to Girdwood.